How to perform Ganesh Chaturthi Puja at Home? - With Mantras - How to Perform Ganesh Puja? Ganesh Chaturthi or Vinayaka Chaturthi is one of the most colorful and widely celebrated festivals in India. Large number of people observe Ganesha Chaturthi poojas at home. Here is an explanation on how to perform Ganesha puja at home as mentioned in Hindu scriptures. Ganesha puja on the Chaturthi day is usually performed at noon but nowadays people perform it when all the family members are present. निर्विघ्न कुरु मे देव सर्वकार्येषु सर्वदा !! Chant anyone Mantra 108 times daily or on Ganesh Chaturthi day. A Clay image of Lord Ganesha. How to perform Ganesh Chaturthi Puja at Home? First clean the house and take a bath. A clay image of Lord Ganesha is installed in a raised platform. 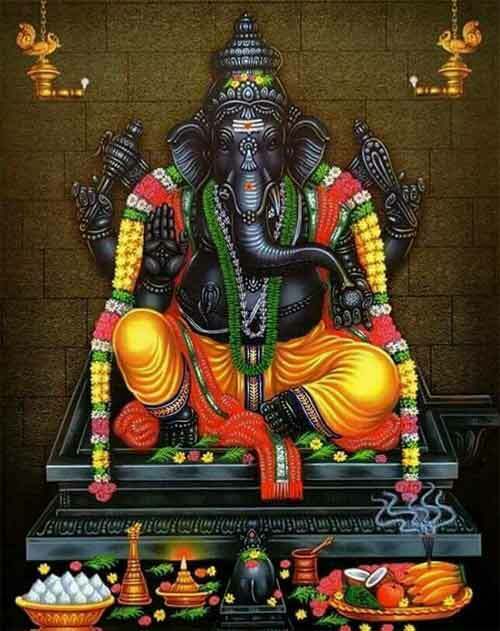 Pray to Lord Ganesh and you can recite mantras or bhajans dedicated to Lord Ganesha. Next step is to invoke Ganesha into the image. This is known as pran-prathishta. The Pran Prathista mantra in Sanskrit to be invoked is found in the Rig Veda and is part of Ganesh Suktha. Offer 21 blades of Durva Grass. Break the coconut or just keep it along with the idol. You can also keep fried grains. (The food of the rat – the vehicle of Ganesha). While performing Ganesha Puja at home, you can always be flexible. The strict rituals are meant for Vedic priests. All you need to be careful is to perform the pujas with a clean body and clean mind.